South Africa is a lion, a grape, a flower, a painting and a smile. It stands out among African nations for its sheer diversity. This land of perpetual sunshine offers urbane cities and old-world vineyards, spectacular vistas and thrilling big game drives. It is well endowed with natural attributes such as the fynbos, a botanically rich region known as the “Cape Floral Kingdom” noted for dramatic flowers such as the king protea. Two mighty oceans collide near the Cape of Good Hope, and great graceful sweeps of coastline stand uncrowded and uncluttered. Private game reserves hark back to the era when the land was owned by elephant, leopard, impala and zebra. Malaria-free reserves are ideal for families with young children. Indeed, many of the extraordinary boutique hotels, lodges and inns are genuinely family friendly with specialized programs and activities catering to each family’s interests. South Africa is also noted for its ancient rock art and cave paintings created by the original San people and dating back millennia. Ukhahlamba-Drakensberg Park, for example, is a UNESCO World Heritage Site that is one of just 23 sites worldwide granted this status on the basis of both natural beauty and cultural significance. It has 500 known sites of San rock art. South Africa appeals to the travel connoisseur who delights in exceptional cuisine, historic architecture, world renowned wines, luxurious railway journeys and outstanding accommodations. From jazz and art galleries, to small craft markets with locally produced arts and textiles, to classic game-viewing South African safaris, this is the lovely composition that is South Africa. South Africa is home to a variety of outstanding and unique lodges and tented camps. This adventure offers three very distinctive properties that give travelers experiences ranging from the classic African safari in search of the 'big five' in Sabi Sands, to the rare and unique fynbos plant kingdom of Grootbos, with its remarkable whale watching opportunities, to grass lands of the Kalahari, home to the traditional San people. 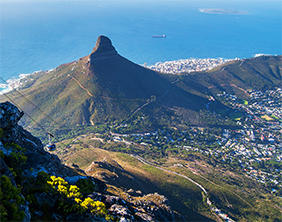 Experience the best of South Africa from Cape Town, South Africa’s charming, coastal capital city. Sample vintages from ward-winning vineyards of the Winelands. Discover the richness of South Africa's wildlife in private game reserves of Sabi Sands and the Tswalu Kalahari Game Reserve, the largest private game reserve in South Africa. Explore the stunning Cape Peninsula, from dramatic Chapman’s Peak to the eccentric South African penguin colony. Explore South Africa's wealth of adventure activities - from safaris to vineyard tours to cosmopolitan cities - tailored to your interests. South Africa's private reserves offer safaris crafted to families in a welcoming environment. Discover South Africa's cosmopolitan Cape Town, the rugged coastline and go on a lifetime safari in Zimbabwe. This Adrenaline Factor: 5 adventure goes rappelling from famed Table Mountain, a race car driving and jet boating. Watch great white sharks from an extraordinary viewpoint… underwater in a three-man, custom-built shark cage. Cape Town, one of the most beautifully situated cities in the world, has a great deal of charm and historical interest. A day in the Winelands offers you a private tour of noted vineyards to learn about the winemaking process and enjoy samples of featured wines. Safari in Sabi Sands Game Reserve to see Africa’s big five – leopard, lion, buffalo, elephant and rhino. Travel into Zambia for an unforgettable journey to Victoria Falls. 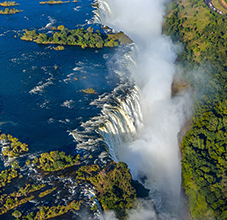 Victoria Falls, the Zambezi River, Botswana’s wild Linyanti Swamps, the malaria-free Madikwe Game Reserve, and a private, guided Winelands tour are all on offer in this remarkable journey.